Keep email running when disaster strikes or you are planning downtime due to maintenance. 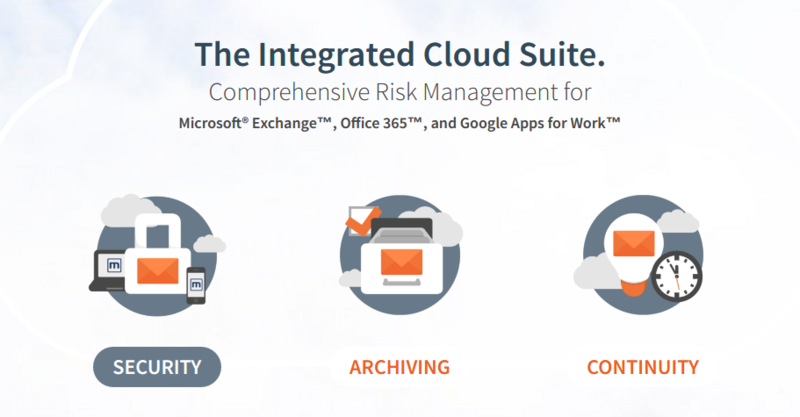 Mimecast delivers cloud-based email management for Microsoft Exchange, Microsoft Office 365, and G Suite, including archiving, continuity and security. By unifying disparate and fragmented email environments into one holistic solution that is always available from the cloud, Mimecast minimizes risk and reduces cost and complexity, while providing total end-to-end control of email. Founded in the United Kingdom in 2003, Mimecast serves more than 8,000 customers and two million users worldwide and has offices in Europe, North America, Africa, Australia and the Channel Islands. An always-on, cloud-based email security solution that reduces the complexity of protecting your organization from malware, spam and data leakage. Mimecast Email Security is the most comprehensive cloud-based email security and compliance solution on the market today. Mimecast’s massively scalable Mail Transfer Agent (MTA) with its multiple layers of malware and spam protection acts as your email bridgehead in the cloud, stopping known and emerging email borne threats before they reach your network. A dynamically scalable, secure, cloud-based archive that delivers near real-time searches and seamlessly integrates with Microsoft Outlook. Mimecast Email Archive is a secure, scalable, cloud-based archive that can significantly reduce the complexity of your email infrastructure. Mimecast’s unrivalled integration with Microsoft Outlook gives users a bottomless mailbox, while superior mailbox management capability helps reduce the load on Microsoft Exchange. required, Mimecast simplifies your network and reduces administration. Mimecast removes spam and malware threats before they reach your network and enforces email content policies and secure communication methods to protect sensitive data. All inbound, outbound and internal email is stored in Mimecast’s resilient and secure archive in accordance with centrally managed retention policies. Unique integration with Microsoft Outlook and Microsoft SharePoint offers users a bottomless mailbox and uninterrupted email should your corporate email systems fail. All service functionality is managed from a single administration console with no additional on-premise hardware required, significantly reducing the overall complexity of managing your email.